Why does my horse paw while eating grain? “Help!! I just got my mare a year ago, and from day one, whenever I feed her grain, she picks up her front foot. She isn’t aggressive in any way, shape, or form. Has anyone ever seen any type of behavior like this? Eating grain is the only time she does it. Thanks! !”-Kelly S.
When I watch horses eat their ‘natural’ food source, grass, it is easy to see that they have to work a little to eat it. If you watch a horse eat grass they pull, tear or rip it up. If you give a young horse hay or grass from your hand they gather it in their lips and pull like they are going to tear it from the ground. As they get more experience they often learn that this isn’t necessary, but it does tend to be their first response. I have even seen horses that pull apart round bales seeming to prefer to eat hay that requires them to pull on it over the loose stuff on the ground. Not all do this and some horses are content to eat the loose hay on the ground. 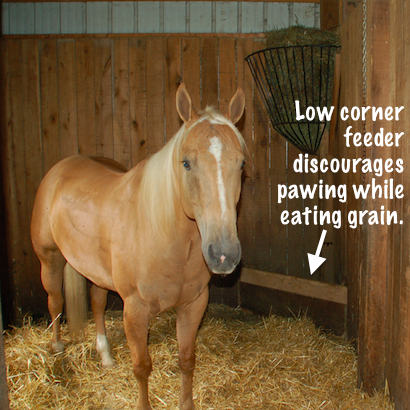 Low corner feeder discourages pawing while eating grain. My theory is that the grain is easy for them to pick up but easy isn’t what they were designed for. Some horses that are picky eaters are ok with nibbling but others seem to struggle with feeling satisfied by the method of feeding. There have been entire books written about the the pros and cons of feeding grain so I will save that topic for another day. If the grain feeder is raised the pawing is generally more animated with the leg being lifted higher. If the grain is fed on the ground the horse tends to spread it out…and then nibble around for it. In our barn we built low corner feeders with a concrete base that was ground level and the boards were about knee height. This eliminated almost 100% of pawing in all the horses because it is more difficult to paw with their heads down and the board in the way. Occasionally a new horse would paw and bump their leg into the board but either the board or the difficulty of the position discouraged pawing and they stopped. My horses have free choice hay and the minimum about of grain necessary. I use a ration balancing feed that doesn’t require a large amount which makes it easier to digest and they tend to eat it and then return to their hay. 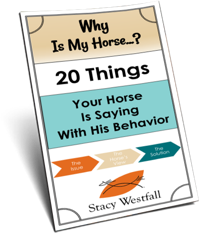 We have also noticed that the horses that we have that would normally paw while eating alone in their stalls don’t tend to exhibit this as much when out in a group. They seem to know that they had better spend more time eating and less time playing if they want to get their fair share. Try experimenting with some of the things listed above and let me know how it goes. Have a suggestion or thought? Leave it below. ← What horsey items would be on your 'must have' list if you had to reduce? I’m curious as to how you can feed free choice hay without your horses getting overweight…?? I use slow feed nets to try to make their hay last longer, but both of my horses are really easy keepers, so I’m afraid they would get overweight if I just gave them all they want…?? Or would that not be a problem? I’d love to hear your experience!! 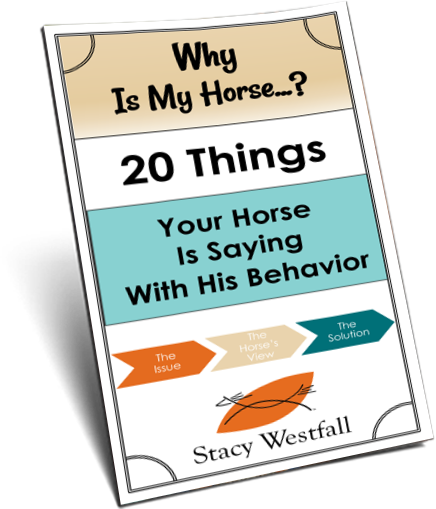 My QH refuses to eat hay set just off the ground in a large rubber tub and instead chooses to pull hay out of the hay rack, drop it on the ground and then eat it. Both my horses are given a small ration of grain with a ration balancer in rubber feed pans on the ground, my QH drags her bucket backwards as she eats and backs up. My TB on the other hand loves eating hay from a large rubber tub or sticking his nose in through the top of hay racks or bags if he can. When it comes to grain he dives into it so I took the large rubber tub my QH doesn’t use and spread his grain throughout to slow him down. At some point prior to my ownership, he had surgery for roaring and when it’s easier for him to get larger amounts of grain in each bite small amounts end up getting into his trachea and cause him to cough (thankfully he never choked), having the larger tub has been a great option, slows him down. I also find, especially with him that occasionally hiding some form of treat (usually sliced carrots or apples) encourages them to slow down as they sort for all the goodies. My 5 year old quarter horse gelding will sometimes hold his leg up while eating. His front legs will also shake while he’s eating feed from a fence feeder attached to his stall gate. Almost like his legs are giving out. He doesn’t do it while eating hay. I got him as a yearling, and he has always done it. He never collapses, but his legs shake. It’s very strange. I’ve owned horses my whole life and have never seen another one shake like him. Any ideas? The little mare I just got for my kids paws very bad while eating I feed all mine in the rubber pans and put them into tires on the ground. She stops eating and paws at the tire until she can get her hoof caught at the rim of the tire to flip it over then she would eat off the ground holding her hoof up so I tied the tire to a tree so she can’t flip it now she holds her leg up the whole time she is eating. I’ve never seen any horse or had my guy with a leg lifting eating grain before, how interesting. Instead when I first got my gelding, he would violently thrash his feed from side to side in his corner feeder, spilling and wasting most of it to the stall floor. He would also pack a mouth full and raise his head over the stall wall to look around while dribbling half of his grain like an toddler learning to use a fork. Someone suggested to me his teeth needed floated as they thought it was a painful occurrence to eat they way he acted, and mentioned they were finding whole grain pieces in his manure. So, considering the advise I had the vet float his teeth with no change in behavior. As I searched for clues and answers I remembered his previous owner fed him from a large cattle trough and I had witnessed him eating his grain while pushing around a large mineral block that was placed in the trough. It sprang to my mind an idea. So I found a round, smooth edged rock from the yard to put in his feed dish. He pushed the first rock out, so I got a bigger rock. It was big enough, heavy enough, and just the right shape that he was forced to maneuver it around his triangular dish. He then had to stick his nose between it and the sides of the dish and take smaller bites and it slowed his eating -problem solved. No more mess with his feed and no more feed left behind in his messes. Who knew a rock could’ve saved me a vet bill, ha ha! I, too, have a mare who will raise a front leg while eating her grain. imagine, when the weather gets bitter cold this procedure gets old even in the barn. 7 years later I no longer stand there caressing her withers but if she should raise a leg when I ask her to lower it, she does. Patience pays off. Thanks for all your good advice. I think I’ll start printing it all down. Sorry Stacy but I don’t agree with lowering the feeder. My mare is one to paw when fed grain.. Only grain. She usually holds her foot up to her belly and leaves it there for a long period of time. I feed out of rubber dishes that just sit on the floor and actually if I raise the feeder she dosnt paw as much. I should have been clear that it was pretty much the total design of that low feeder I described that worked. If I had only lowered the feeder or used the pan on the floor they probably would have continued. I’m glad your horse did better with it high. My 15 year old QH mare lifts and waves one front foot while eating grain but she also does this when she wants out of her stall or paddock, when she is tired or bored and sometimes just to get my attention. I believe that this is a different behavior than pawing while eating but it started when she was just beginning to eat grain at about 4 months old. Of nine horses, we only have one that will raise his right leg while eating grain but he doesn’t paw, he just holds it up for a few seconds, puts it back down and then starts over again. He doesn’t even always do it. From watching the three of them in the same paddock (he’s a gelding with two mares), it appears to be a warning to the mares that he does not want to share. They are all good about staying in their own feed dish, at least 99% of the time. The gelding is the only one who does this. My little mini seems to just enjoy his grain and does a little pawing. However, he does try to flip his dish over and eat it off the ground. It hangs low to the ground on the fence. Something to think about. My Weanling does it, too. She gets carrots and a little grain, and she picks the carrots first. When the carrots are nearly eaten, she starts lifting her leg. I think she’s frustrated that there’s no more carrots. Because she doesn’t hurt herself or others that way, I don’t think I want to make a problem out of her behaviour. My mare lifts her foot if I feed her anything in a feed bucket, not just grain, and in the paddock with other horses. I think she just feels excited about getting something special. She is not aggressive at all – just enjoying the moment I think. my gelding alway paws when eating his grain. sometimes he does it also while i brush him. i stop him by taping his foot so he knows he isn’t supposed to do this. When he eats his grain (from the dry concret ground) he usually just lifts up one leg and stands on tree legs. he eats his grain slowly and seems go enjoy it. to me, that doesn’t look stressed or aggressive. My gelding has done it since he was weaned, varying the pawing routine by picking up his food bin and throwing it, sending feed everywhere. I worried that the silly beast was going to give himself sand colic by nibbling the feed out of the sand, so I gave him a flat bit of clean rubber conveyor belting to eat off of. He can’t throw it or knock it over, and as he grows up he seems to be stopping the habit. Doesn’t the lower feeder pose a danger to the horse since it is so low? I would be afraid that the horse could get cast in the stall. We never had an issue with it and hundreds of horses went through our barn over the years. It is low enough to step in and out of if one would choose to for some reason…but they are horses and many can find ways to get in trouble. Horses getting cast usually happens along a flat wall where they can’t get something to push off from. I personally don’t like the idea of feeding a group of horses all together because you don’t know how much each horse is getting . I also don’t like it because it can cause other behavioral issues. One of ours does this also. We call it a “grain-gasm” as he only does it for his grain. He doesn’t eat fast, in fact he is the slowest of eaters. He just seems to really enjoy his grain. Eyes closed, foot up and curled under and munches away. I had a gelding who did this as well as well as wolfing down his grain as well. I tried all different types of feeders including ground feeders. I finally stuck a salt block in his feeder that he had to work around to eat. It worked in slowing him down and he started eating on all 4 feet. I’ve got an 5 years old OTTB ( I bought him a year ago) that ALWAYS paw while eating grain. He has is bucket directly on the ground and he’s very capable of pawing. We tried to put a bord just like you said but he didn’t stop and he was hurting his knees so we removed the board. He already had that behavior when I bought him. And just like your horses, he as a little amount of grain since my hay is very nutritive and he is on a ”all you can eat” hay diet. He go out each day for at least 6 hours with my other horse and they have access to hay the entire day when grass is not available just like now because it’s winter here in Canada and we have snow that covers our ground. And if I feed him with my other horse in the field, my other horse will take control of the two buckets (even if they are apart) and he won’t be able to eat his grain. So I was wondering if you’ve got more ideas to help me out? Interesting…they are all individuals aren’t they? Doesn’t sound like group eating will work for you. Is there a reason the pawing bothers you a lot? Also, how long did he continue banging his knees up with the board corner feeder? I left the bar in place for a week and a half and I have removed the bar because he got a big bruise on the knee (he had a swollen knee for 2 weeks and I have him give Butazone because he was limping). The reason why this bad habit bothers me is that ithe hurts sometimes his pasterns with his shoes and I fear that over time that pawing will not be good for his joints … not to mention the premature wear of his shoes or the rubber mat in his stall. So glad you addressed this. My mare has just started this since she’s been pregnant. My farrier asked me what was going on, I didn’t know what to tell her. I’ll try lowering her feed bucket. My mustang ‘wrings’ her front leg whenever she is frustrated…like waiting to go out in the a.m. She wrings that leg the whole time she eats her feed, in a tub on the ground. She is head honcho so nobody would challenge her; it’s not a threat. I think she’s just ‘piggy’ and can’t get it down fast enough. I give her the biggest flat rubber bucket but sometimes she does still flip it. Sometimes I give her the feed a scoop at a time as I do other chores so she doesn’t waste it. I have considered hauling a tire out there and putting the feed tub in the center…just a thought! I have done the tire thing and my gelding pawed a trench/mote around it, lol. My horse does this whether he’s eating his grain from a bucket hung in his stall or from a feed bowl on the ground out in his pasture. He’s not forceful about it, just picks up his leg and suspends it. My horse does this. He is fed as much forage as I can (about 16lb of meadow hay then some good barley straw to nibble on if he finishes that) hay in a large haylage net suspended from the roof so it’s not touching the walls but not so far away that he can’t push it against a wall if he is hungry enough to feel the need to do so, straw is in large holed net on the wall. His feed is chaff, with a little soaked feed (the tasty bit) some herbs to help with the effects of dust when he is in a lot through winter and a general vit and min supplement. It’s fed in large bucket on the floor. Can’t make changes to the stable as I rent them…. Anything else I can do? Perhaps a long wide through? I know that the yard will feed his breakfast in the bucket as they feed and turnout all horses everyday. Is he being really aggressive or is it just annoying you? So glad to read this! I’m not the only one! I feed my mare from a bowl on the ground and she doesn’t EXACTLY paw but from the day I brought her home she always lifts her hoof like she wants to, but she just holds it there. She is very food motivated and I figured it wasn’t a real issue but I had never seen a horse do it before, not WHILE eating. I always was a little bothered by it just because I wasn’t sure why she does it. I didn’t really address the ‘holding’ leg horses did I? I have seen them too, they look very intensely focused when they stand like that don’t they?